Hello everyone, I’m back from the MarsSed 2010 meeting in ElPaso! The meeting was great: it was small and focused on sedimentology and stratigraphy on Mars, with lots of room for discussion. Even better, there were plenty of terrestrial geologists attending, and their comments were extremely helpful for me, and probably many other Martians who lack a geology background. After two and a half days of presentations and discussion (and a lot of learning on my part), we headed off on our field trip to the Guadalupe Mountains! We started off in a salt flat graben with a lovely view of the Guadalupe mountains. What’s a graben, you say? It is a low-lying block of land, bordered by parallel faults. If you have heard of the “basin and range” region of the southwestern US, then the basins are graben. The mountain ranges are also called “horsts”. A nice diagram of horsts and graben. This is how the "basin and range" area of the southwest formed. The graben that we stopped in was a salt flat, where gypsum and halite are left behind when water collects in the lowlands and then dries out. 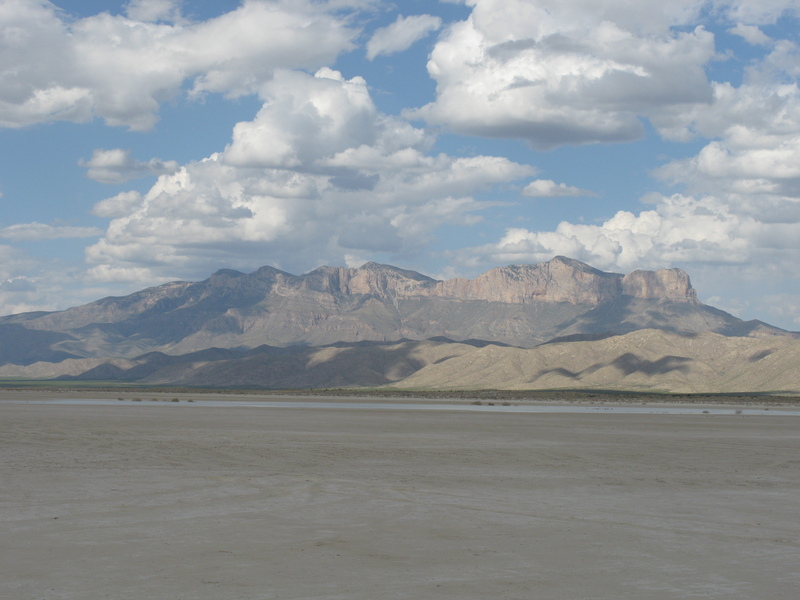 A view of the Guadalupe Mountains from the salt flat. From our vantage point, we studied the nicely exposed mountains and compared them to a detailed cross-section of the area. The rocks of the mountains were once a large carbonate reef on a continental shelf. When sea level was high, thick carbonate beds were deposited on the slope of the continental shelf, and when sea level fell, sand and silt from the continent were transported across the reef and deposited in the floor of the ocean basin. Here is a nice illustration that we found at one of the national park exhibits on the last day that really helped clear things up for me. 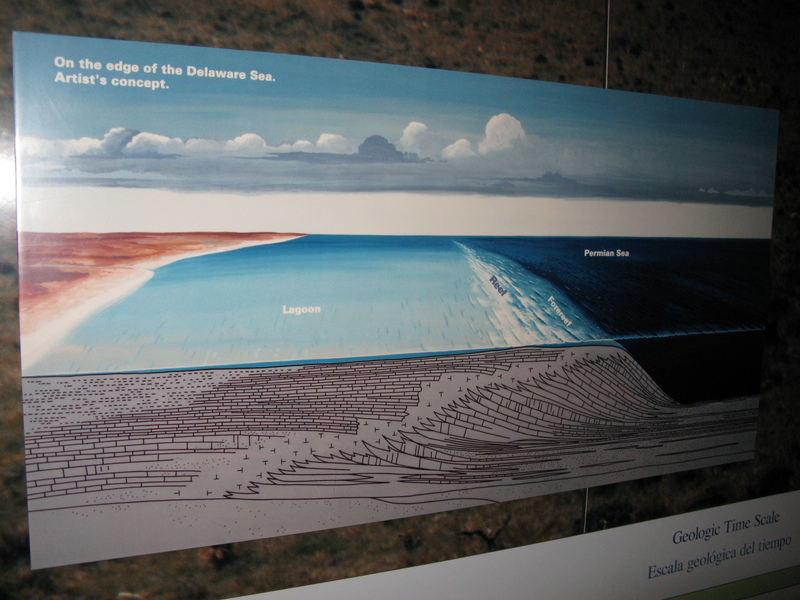 A diagram showing the relationship between the geographic setting and the underlying stratigraphy of the shelf and reef. 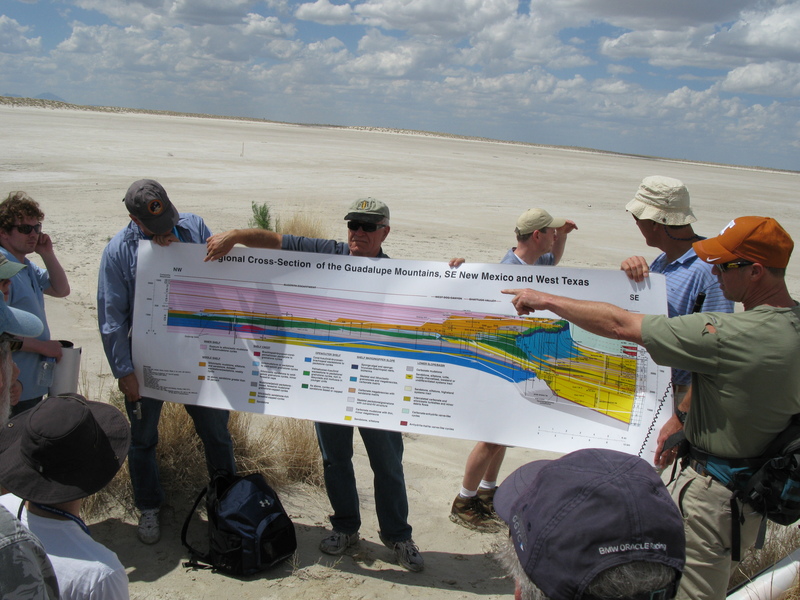 Here we are on the salt flat taking our first look at the stratigraphic cross section of the Guadalupe mountains. The mountains are off to the right, outside the field of view of this picture. You may wonder what the relevance of ancient ocean reefs are for a bunch of Mars scientists. Fair enough. Nobody claims that we would find a big carbonate reef on Mars. Believe me, scientists have been searching for carbonates on Mars for decades. Recently, some small amounts have been detected, but nothing comparable to a huge reef. We were instead studying the reef as an example of a well-understood stratigraphy on Earth, and trying to learn how that stratigraphy was deduced. One of the main lessons was that not everything starts as a flat-lying layer! In fact, the edge of the reef appears to form a nearly horizontal layer, but it is actually made up of multiple sequences building outward into the basin. It just seems to form a layer because the reef always forms at the edge of the continental shelf. You can sort of see this “fake” layer in the pictures above. It is dark blue in the colorful cross section and is the light-toned band in cross section in the artist’s impression. Layered evaporite deposits in the Castile Formation in the Delaware Basin. 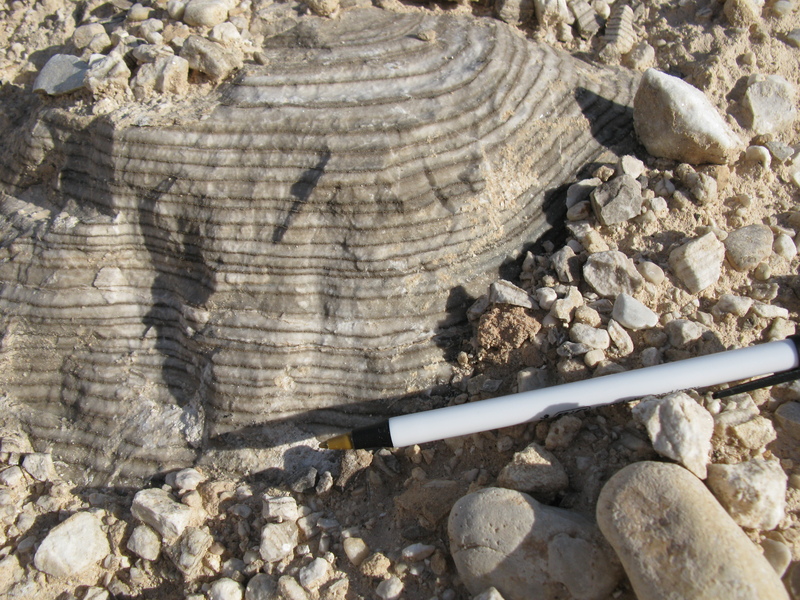 The light layers are gypsum, formed during the summer when evaporation rates were high, the dark layers are carbonate formed in the winter when evaporation was slower. The light layers are gypsum and the dark layers are carbonate. The current theory is that each couplet represents one annual cycle: gypsum was deposited in the summer when evaporation was rapid, and carbonates were deposited in the winter. Apparently some poor graduate student counted all 260,000 couplets, which implies that it took about that many years to fill the basin with evaporites. Something similar may have happened in the Mediterranean Sea more recently. It is thought that occasionally, the ocean level drops to the point where the Mediterranean is cut off from the Atlantic, and begins to dry out, depositing similar salts on its floor. The relevance to Mars in this case is a lot more clear. There is evidence that many large craters were once filled with water. Now they are bone-dry, so presumably big evaporite deposits should be common on Mars! There are nice big stacks of hydrated sulfates at the bottom of Valles Marineris which might be remnants of such a deposit that precipitated out of a body of water in the canyon. Stay tuned for Days 2 and 3 of the field trip! If you’re really interested, I suggest that you check out the awesome field guide that was made especially for our trip. For those not familiar with the conference, the fall meeting of the American Geophysical Union is a terrifyingly, overwhelmingly large conference. Each year, something like 16,000 geoscientists descend on San Francisco to share their work. It is also one of the major planetary science conferences, so a lot of new results are first presented here. 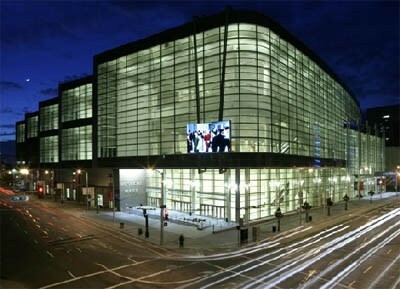 Moscone Center in San Francisco. This building is filled with science at every fall AGU meeting. This year, the first talks that I checked out on Monday were about radar observations of Mars. 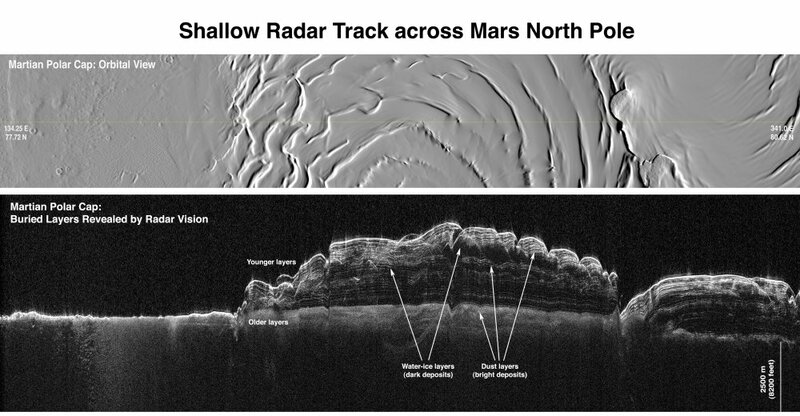 By sending radar waves from spacecraft to the surface and then recieving the reflected waves, we can learn a lot about Mars. In particular, since radar penetrates tens to hundreds of meters below the visible surface, it can reveal otherwise hidden structures. This has been especially successful at mapping the structure of the polar caps, because radar penetrates through ice quite well. Roger Phillips gave a talk summarizing some of the results from the SHARAD radar instrument on MRO. Among other thers, SHARAD has found evidence that the spiral troughs in the north polar ice cap have migrated over time, as predicted many years ago by theoretical models. 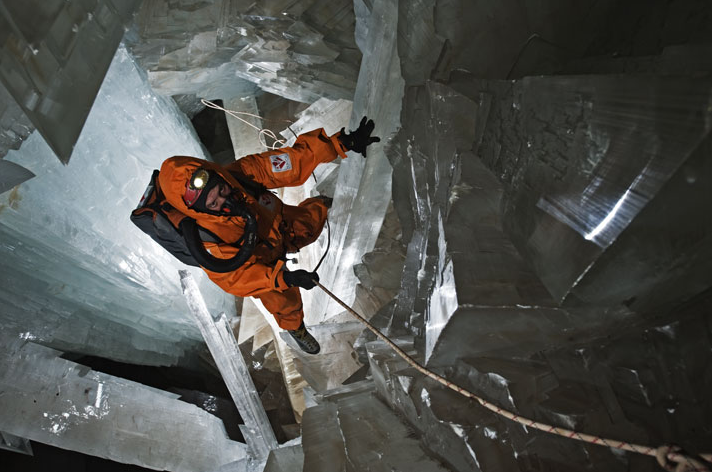 SHARAD has also found ancient buried canyons in the polar ice, which menas the ice caps have been around for quite a while. There are also some exiting new results implying that the material filling valleys in the Deuteronilus Mensae area is quite transparent to radar waves, and might in fact be something like glacier ice. After the radar talks, there were a whole bunch of presentations about aqueous alteration on Mars. One of the main lessons that I took away from those talks was that Mars is still a very confusing place. 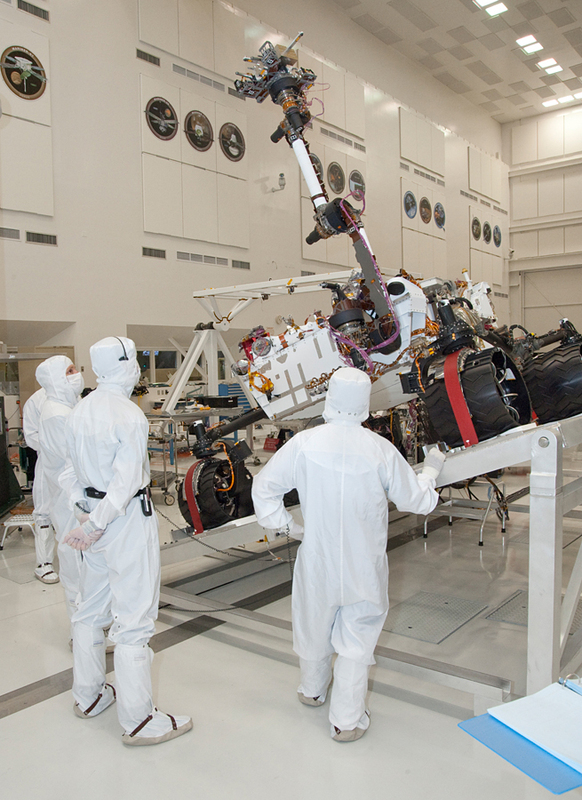 For example, Hap McSween used data from the Mars rovers and characterized typical soils at both landing sites. He found that the compositions of soils are roughly 70% unaltered material and 30% alteration products. He also showed that the soil compositions are quite similar between the two landing sites, which are on opposite sides of the planet, and that the unaltered portion of the soil is similar to the rocks at both sites. However, the next talk by Josh Bandfield used orbital data and found that in general rocks on Mars have more of the mineral olivine than the soils. This is a somewhat different result than the rover data, and it might imply that rocks on Mars actually have more magnesium and iron than previously thought. 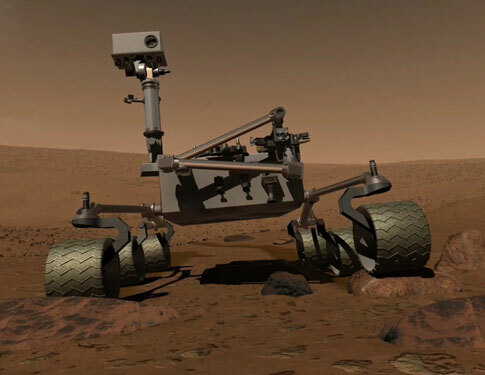 Other talks related to Mars alteration focused on “clay” and sulfate minerals detected on Mars. One that I found particularly interesting was by Paul Niles, who pointed out that Mars is an “obliquity-driven” planet. In other words, its tilt varies widely, and the Mars we see now is not typical. 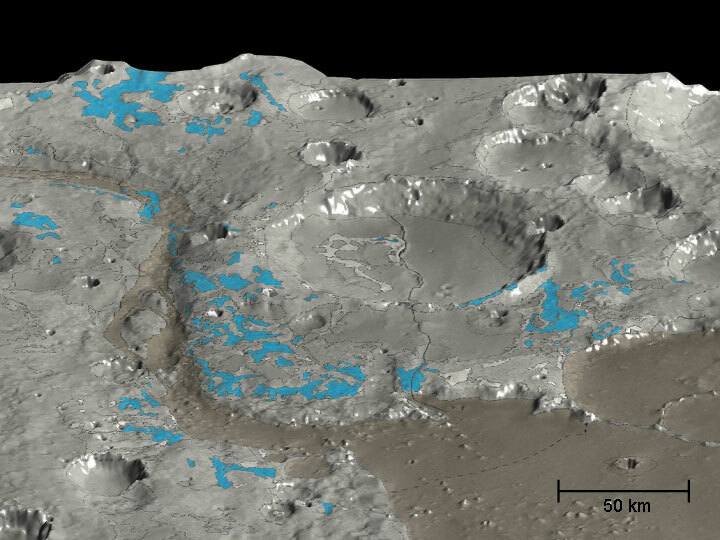 Niles suggested that during more typical periods, ice might have formed large layers at Mawrth Vallis, a location known for its strong hydrated mineral features. Melting at the base of that ice could have leached the rocks, explaining the presence of specific Al-bearing clay minerals. Another interesting talk was by Itav Halevy, who took a look at how the presence of SO2 gas influences the formation of carbonate minerals. It turns out, even a tiny amount of SO2 gas (which is often released by volcanoes) can prefent the formation of CaCO3. If there is iron around, FeCO3 (the mineral siderite) forms instead. The implication is that sulfur minerals should form in different locations than clay minerals and siderite. Continuing with the sulfur theme, Albert Yen talked about some results from the Spirit rover. He said that basically, if the rover had to get stuck, it picked a really fascinating place to do it! 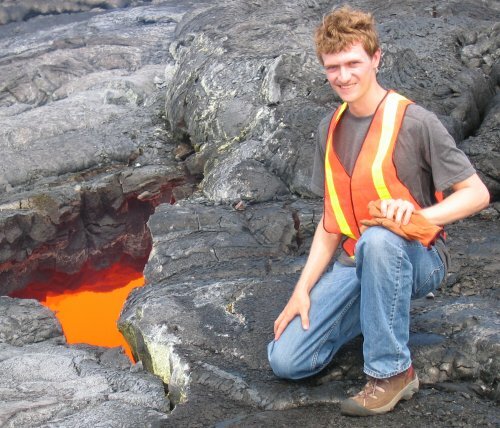 Based on the compositions measured, it turns out that there is too much sulfur in the soil to balance it out by assuming it is combined with other elements like Fe and Mg. That means there might be pure elemental sulfur mixed in with the soil, which would be consistent with hydrothermal activity! My officemate and occasional contributor here at the Martian Chronicles, Briony Horgan, also gave a nice talk summarizing some of her recent work. For a long time there has been a question about the so-called “surface type 2” on mars. This surface type has higher than usual Si, but that could be due to a different type of lava, or alteration of the more common basalt seen elsewhere on Mars. Briony presented new evidence, based on the overall shape of the spectra of surface type 2 regions, that these areas might be due to a silica glass coating! This sort of coating could form when thin films of water from thawing ground ice altered the surface of sand grains, and would imply relatively recent alteration processes on mars. Finally, the day ended with the Whipple prize lecture, which was unfortunately full of some misleading information about the history and status of Mars science. But that’s the topic for a future post. Massive Crystals: The coolest thing I’ve ever seen. These are the largest crystals yet to be found on Earth, with some reaching over 30 feet in length! 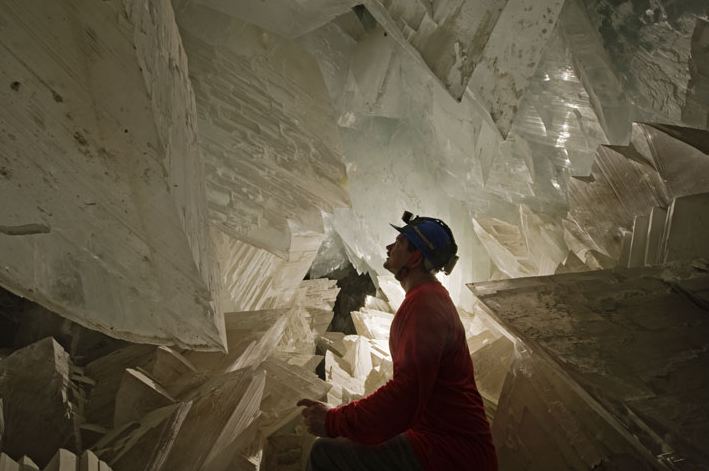 As reported in NG, The Cueva de los Cristales is located 1000 feet below ground in the Chihuahua desert, and was discovered in 2000 during drilling for a nearby lead and silver mine. The cave is excrutiatingly hot and humid – 112 degrees F and 90-100% humidity! The cave is so hot, that suiting up to go inside is sort of like doing a reverse space walk. Everyone has to wear ice packs, full body insulation, and a respirator mask in the cave. The reason the cave is so hot is also part of the reason the crystals formed here. The cave lies above a magma resovoir, which heated the local groundwater. Until 1985, when the mining operation lowered the local water table to extend the mine, the cave was completely submerged in this super heated groundwater. As the magma cooled, the water in the cave cooled enough to deposit selenite, a form of gypsum. 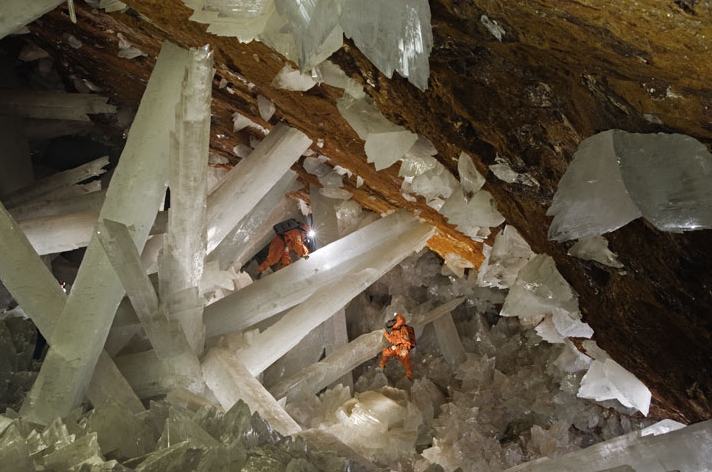 The environment in this cave was stable enough over hundreds of thousands of years that the selenite crystals were able to continue growing uninterrupted. We know there are massive gypsum deposits on Mars (ref: my thesis! 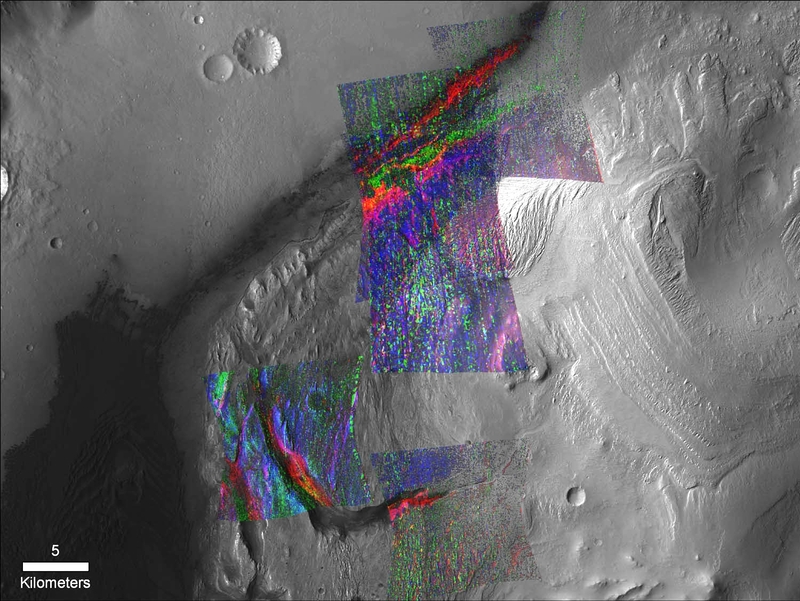 ), and we know that Mars has been much more tectonically stable than the Earth, so who knows? We might find crystal deposits on Mars to dwarf Cueva de los Cristales. Everything’s bigger on Mars anyway, right? For those of you playing along at home, I thought I should point out that most of the presentations so far are posted at the “marsoweb” landing site website, so I encourage you to go check them out. Also, in case you were wondering, I have no idea which sites I want to survive this process. I have one or two that I am skeptical of, but I am really glad that today we are not just voting for which sites that we want. What we will do is answer eleven questions about each site with green, yellow or red depending upon whether we this the site is good, ok, or bad in that regard. Then in the end, we just find the three with the most greens. It is sure to be an interesting day, and I know that there are going to be some flaring tempers and heated discussions. I’ll post as soon as possible with the results. Stay tuned! Comments: Comments Off on MSL Workshop Presentations! The south Meridiani landing site is a newcomer to the bunch. It was added earlier this summer as a replacement for the north meridiani site. The south Meridiani site is about 100 km due south of the Opportunity rover landing site and about 100 km due east of the Miyamoto site. 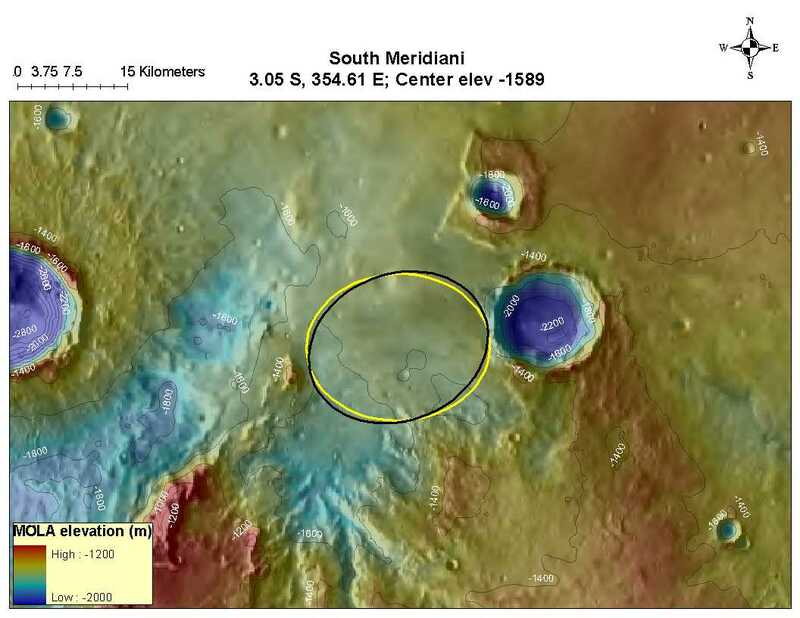 What makes the south Meridiani site interesting is that, just south of the landing ellipse, you transition from Meridiani plains material to ancient, water-eroded hills containing phyllosilicates. The site has good context, in that we would land on the same sort of material that Opportunity is studying. However, the context for the phyllosilicates in the hills is bsically zero. We don’t know where they came from or how they got there. 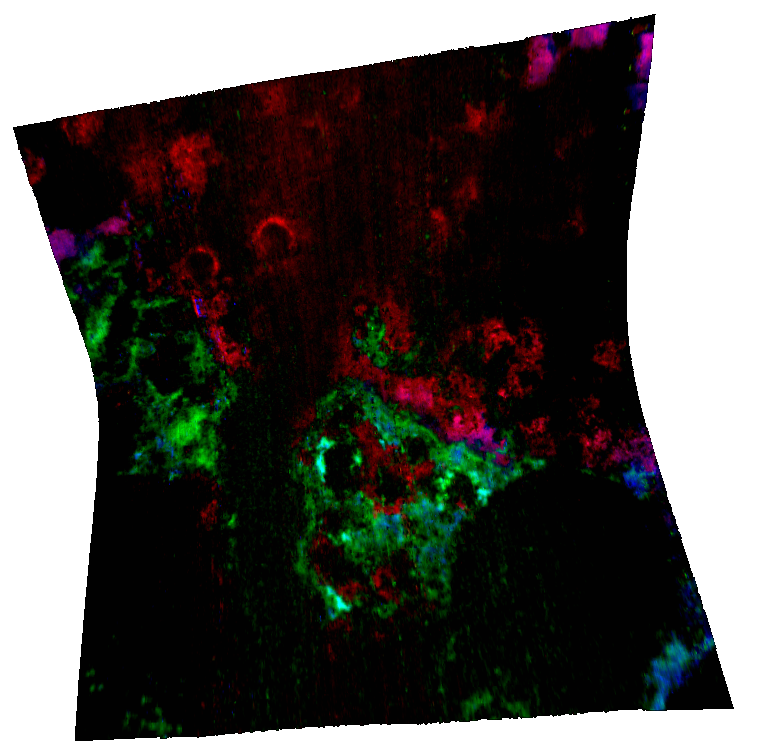 For diversity of mineralogy, the rocks in the ellipse are probably sulfate-bearing just like the ones Opportunity sees, and are also rich in hematite (probably more blueberries). South of the ellipse, the clays in the hills are pretty diverse, with different chemistries. Habitability? Well, we are pretty sure the meridiani rocks were once soaked in groundwater, but that water may have been a very salty and acidic brine. We don’t really know about how the phyllosilicates got there, but if they were marine or lake sediments, that would be great for habitability. However, they could also be crater ejects, which is somewhat less good. As far as preservation goes, both sulfates and phyllosilicates are good at preserving organics under some conditions, so you would have two different, but good chances to see preserved biomarkers. The mission at south Meridiani would be three phases. Phase 1 would be landing on the meridiani plains and using the new tools on MSL to better understand the same general rocks that Opportunity has been studying. MSL would land in a place that is in lower layers than Opportunity, so would fill in some of the earlier story. Phase two would be driving south to the contact between the meridiani plains unit and the ancient clay-bearing hills. And phase three would be exploring the hills. The discussion phase once again brough up some tough and important questions about the site. Someone asked whether, when we cross the boundary between the plains and the hills, we are seeing the transition between a sulfate-forming environment and a clay-forming environment, or are we just seeing “before and after” and missing that transition. Someone pointed out that even if there are “missing layers” due to some period of erosion or non-deposition, that still contains information, because the surface would be weathered and altered before the new rocks were laid on top. Someone else pointed out that this is a perfect example of an interesting mineralogy site, but with no context. We don’t know the whole “source to sink: story of the phyllosilicates. It was compared with all of the interesting rocks that Spirit has seen in the Columbia Hills: all very cool, but hard to piece together into a story. Another very important question was whether the clay-bearing rocks had any distinctive appearance. Because MSL will probably not be able to identify them from very far away. (at best, ChemCam, the laser, might be able to… that’s part of my future research, so we’ll see) There wasn’t a good answer to this, though the phyllosilicates are seen in somewhat diagnositc “fractured” rocks. The bottom line is that this site would be interesting because we would learn more about Meridiani, and would be able to cross a transition and explore very old clay-bearing rocks. However, the context for those clays is pretty weak, and we might end up being totally confused due to that lack of context. This site does have the advantage that it is incredibly safe. Meridiani planum is FLAT. I don’t think it’s the best science site, but it is an acceptable science site, and it may end up surviving or being brought back later on because it is so easy to land on.